What is Minimum Essential Budget Standards research? The research is focus group led, working with members of the public to establish social consensus on what is needed for a minimum living standard. The research is informed by expert knowledge as needed, e.g. nutrition. It produces detailed household budgets which establish what is needed for an acceptable Minimum Essential Standard of Living (MESL), for 90% of households in Ireland. The Minimum Essential Budget Standards (MEBS) Research Centre was established by the VPSJ in 2016, as the next step in over 17 years of income adequacy research (of which 15 years focused on budget standards research). The VPSJ has pioneered the use of the Consensual Budget Standards methodology in Ireland and its application to establishing minimum expenditure and income needs. The VPSJ’s MEBS research centre continues to be the only organisation carrying out this work in Ireland. The distinctive strength of the research approach is its grounding in reality and lived experience of people. Through this research the VPSJ plays an active role in trying to ensure a fairer society for all. The minimum standards data is widely used in the policy debate across government departments, in analysis by NGOs, contributes to the annual Budget process, and at a practical level it is used by organisations working directly with people such as SVP and MABS. Furthermore, the research forms the basis of the ISI’s reasonable living expenses and the Living Wage calculations. The role of the MEBS Research Centre is to continue this crucial research, providing evidence to inform policy on the income and supports required to overcome poverty and social exclusion. The Minimum Income Standard calculator (MISc.ie) provides ready access to tailored data on the minimum expenditure and income needs of the majority of household types across Ireland. Using MISc.ie you can define specific household compositions and employment scenarios, for households in Urban and Rural areas, and examine their particular minimum expenditure and income needs. 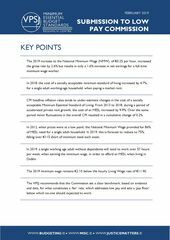 The calculator uses the latest Minimum Essential Standard of Living (MESL) expenditure data, calculating the minimum income households in Ireland require to afford a socially acceptable minimum standard of living. MISc.ie is currently using the latest 2017 MESL expenditure needs data, and applicable 2018 income rates.